Whose Egg Is Going to Crack First? 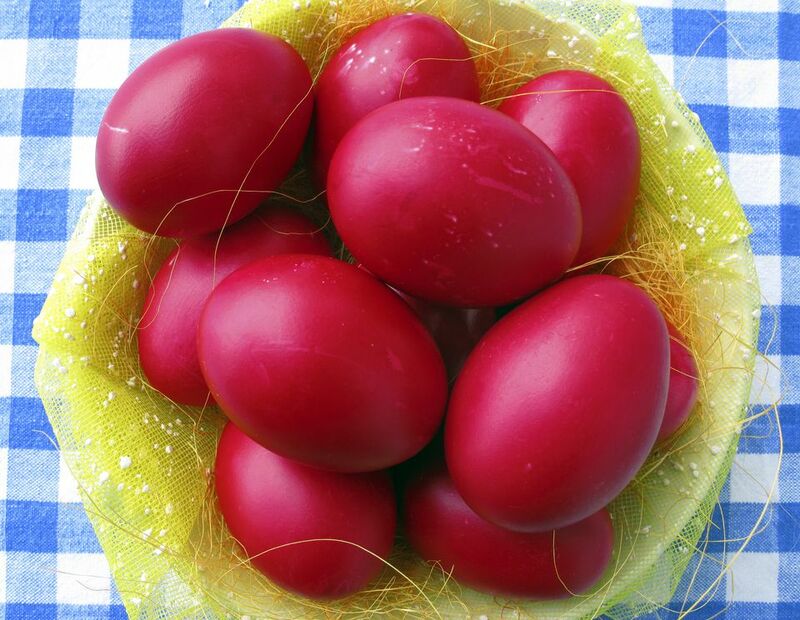 Red eggs (kokkina avga) are a traditional part of the Greek Easter Sunday celebration. They are lovingly made, either with onion skins or dye and then woven and baked into a tsoureki (three-braided Easter bread signifying the Holy Trinity), used as table decorations, and are the key piece to a fun game called tsougrisma, which tests the eggs' strength—and perhaps the players' strategy. The word tsougrisma means "clinking together" or "clashing." In Greek, it is τσούγκρισμα and is pronounced TSOO-grees-mah. The cracking tradition symbolizes Christ's resurrection from the dead and birth into eternal life. To play, each player holds a red egg, and one taps the end of her or his egg lightly against the end of the other player's egg. When one egg's end is cracked, the person with the unbroken egg uses the same end of the egg to try to crack the other end of the opponent's egg. While you cracking the eggs, one person says, "Christos Anesti" (Christ has risen! ), while the other person says, "Alithos Anesti" (Indeed he has risen! ), symbolizing Christ’s emergence from the tomb. There are no rules about which end of the egg to tap first, how to hold it, or how to tap the egg against the other, and there's never been a method that has been proven to work every time. Good luck! After the cracking is done, not a bit of egg is wasted. They are peeled, cut, and served with salt and vinegar. Some families make a small appetizer tray with the eggs along with leftover cold lamb, and other delicacies to be served with red wine or ouzo to guests who stop by on Easter Monday or at other times during the week ater the holiday. In Greece, red Easter eggs are traditionally dyed on Holy Thursday, but they can be done on any day leading up to Easter Sunday. They are the first food eaten after the strict fasting of Lent in some families, while others enjoy them after dinner when everyone is gathered around the table to play the game. The red color symbolizes the blood and sacrifice of Christ on the cross and the egg symbolizes rebirth. The first red egg that is dyed is considered to be the egg of the Virgin Mary and is saved in the home for protection against the evil eye until the next year when a new "first egg" is dyed. Yet others take the egg to the midnight church service on Holy Saturday known as the anastisi.